Soft, gooey, sticky, and chewy, these Hot Cocoa Cookies are loaded with chocolate and topped with a toasted marshmallow for the perfect Christmas treat. Taste: Like hot cocoa but WAY better. Tons more chocolate and marshmallow flavor. Texture: The best part. Soft, ooey, gooey, sticky, and completely crave-worthy. Ease: Super easy! Just be careful if you’re toasting the marshmallows with a broiler, they go from toasted to burnt VERY quickly. Pros: Perfect Christmas cookie recipe. Cons: Difficult to store or travel since the marshmallow gets sticky. Would I make this again? I make these every winter! What’s better than sipping hot cocoa on a chilly winter evening…? Biting into a still-warm cookie that’s an explosion of chocolate and marshmallow in the best possible way. These Hot Cocoa Cookies are my JAM. Everything you could want in such a small package. Allllll the most mouthwatering textures in a single bite. And all of the flavors of the Christmas season. They’re kind of perfect! Plus it’s a pretty simple and straightforward recipe to make. Like I mentioned in the Recipe Rundown, you can use your broiler to toast the marshmallows but I find a kitchen torch gives you way more control. And it’s more fun. Maybe this is the year to add one to your Christmas wishlist? This recipe actually comes from my digital cookbook Tessa’s Christmas Cookies. It has all of my go-to holiday cookie recipes plus fun gift packaging ideas. There’s also a bonus kit of Christmas Cookie Exchange printables! Click here to see more. In a medium bowl, stir together the flour, hot chocolate mix, baking powder, cinnamon, and salt. 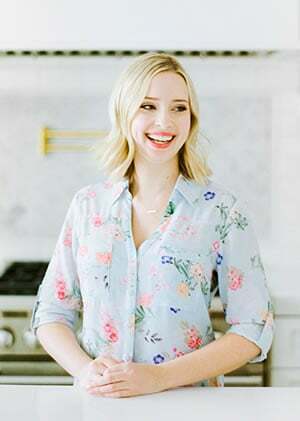 In a large bowl, use an electric mixer to beat the butter, granulated sugar, and brown sugar on medium-high speed until well-combined and smooth, 1 to 2 minutes. Add the egg and egg yolk and beat until combined. Add the vanilla extract. On low speed gradually add the flour mixture. Fold in the chocolate chips with a rubber spatula. Chill for about 1 hour, or until the dough is no longer sticky. Meanwhile, preheat the oven to 350°F. Line baking sheets with parchment paper or silicone baking mats. Using a spoon or spring-loaded scoop, drop 1 1/2-tablespoon sized balls of dough onto the prepared baking sheets. Bake for about 10 minutes. 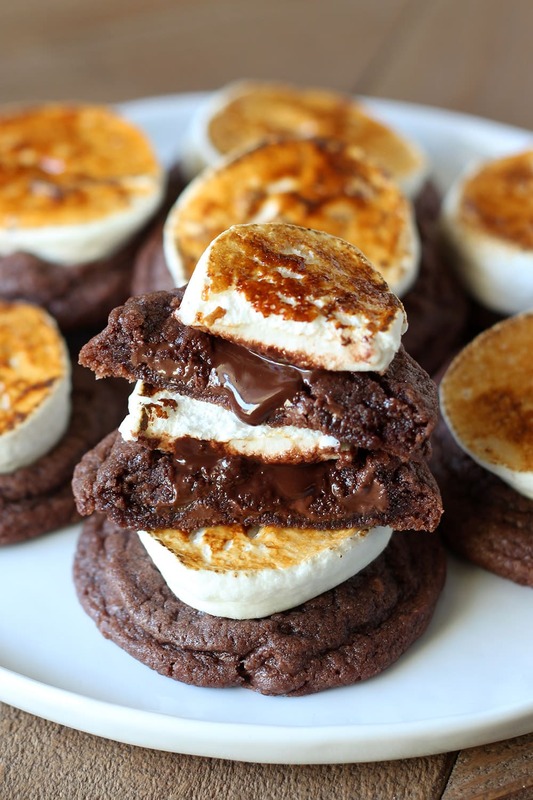 Remove from oven and top each cookie with a piece of semisweet chocolate and 1 marshmallow half, cut side up. Return to oven and continue to bake for another 4 minutes, or until the marshmallow begins to melt slightly. Use a kitchen torch to toast the tops of the marshmallows. Alternatively, place the cookies under the broiler for about 30 seconds to toast the marshmallows. Be careful as the marshmallows can go from toasted to burnt very quickly! Let cool on baking sheets for 5 minutes before removing to wire racks to cool completely. Cookies are best served the day they are made due to the marshmallow but may be stored in an airtight container in one flat layer for up to 3 days. yes, love the textures here, these are wonderfully different from any Christmas cookies I’ve ever made, so thank you for this recipe!